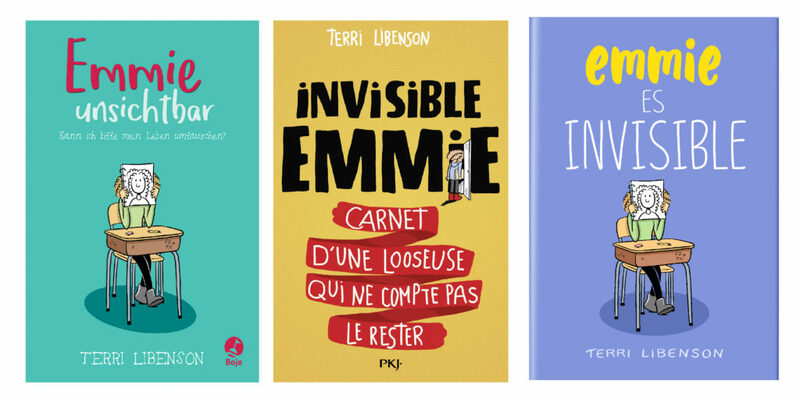 I’m going to get “Emmie Invisible” and it will show soon. I’m looking at “Emmie around the world” (i.e. http://terrilibenson.com/2017/05/emmie-around-the-world/), but I’m curios about the different countries. I think “unsichthar” (German? ), “es” (Spanish? ), and “carnet…” (French?). [Obviously, I’m not very with this stuff. I had a brain tumor in 2003 a long time ago.] Anyhow, I get some other pictures, but I can’t find “carnet…”. Can you find this one (by itself)? Thanks! By the way, I think I’ll giving some of my granddaughters from “Emmie Invisible” and “the Pajama Diaries” (especially Bat-Zilla)! Yes, German, French, and Spanish. Don’t ask me to translate, it won’t be pretty. Thanks for buying the books!